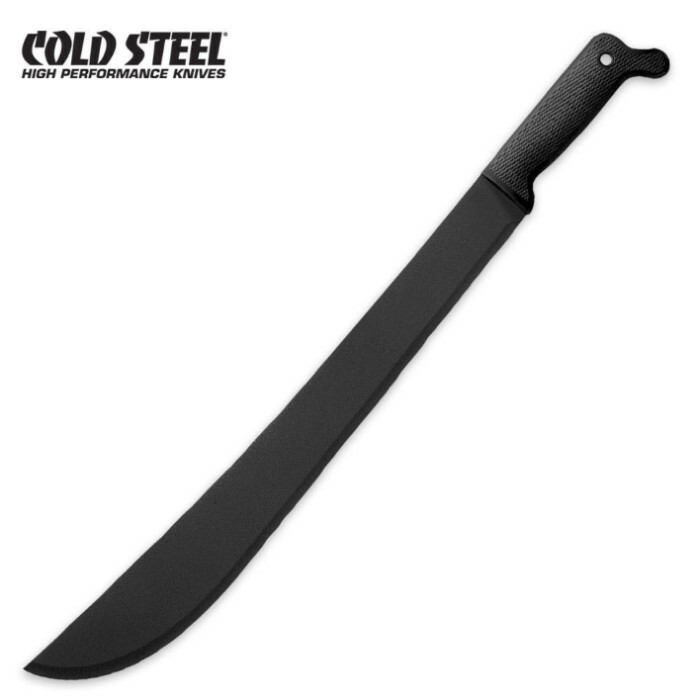 Cold Steel Latin Machete 18 in. I got this a week or two back, now I'm doing the review. TrueSwords: Lovely shipping rate, got it saturday morning. You guys made me feel like a little boy on Christmas morning. I love the Customer service at this place. Cold Steel: The machete itself was a beauty, only one problem, it's the sticker. I pull it out as gently as I can, and the gunk was still on. I washed it, and it left a mark, so eh. But I finally got to use it today to give a proper review and it works great! I did anciently hit it on metal it and it bent the groove part...ish. Either wait, it works wonder on trees. this was my first time ordering from this website and i honestly didn't know what to expect. but when i got it in the mail i was so excited. The blade was sharp, everything was sturdy and it has great weight. Something I would actually take into the jungle with me. TrueSwords, expect me to come back for more! Nice sturdy machete, strong and looks nice. it doesn't come very sharp at all though i really wish it did, but a fair bit of sharpening fixes it up well.